Bearded dragons, hailing from the deserts of central Australia, are well adapted for living in hot, unforgiving habitats. Bearded dragons require bright and warm conditions during the daytime. Provide it with a combination of incandescent heat lamps and full-spectrum fluorescent bulbs. 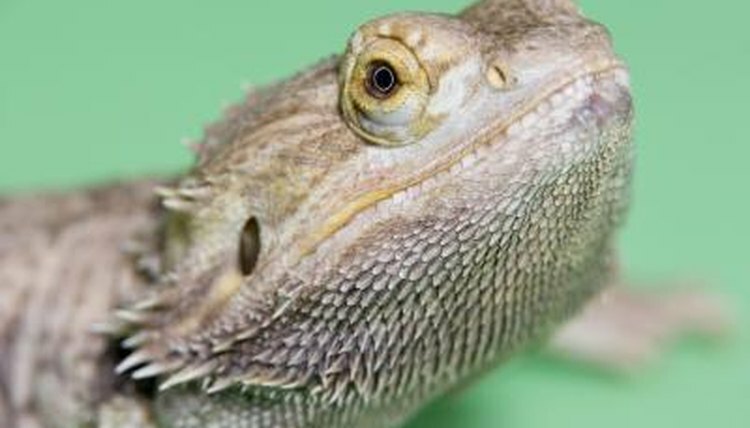 Deserts cool off greatly at night, and bearded dragons are usually comfortable without a nocturnal heat source. Bearded dragons are heliothermic -- sun loving -- lizards who have evolved to derive heat from above rather than from the earth. Accordingly, you should use incandescent lights at one end of the cage to provide heat, and UVB-producing bulbs as well so that they can use their dietary calcium. The surface temperatures directly under the basking light should be about 110 degrees Fahrenheit. To prevent stressing your lizard, you must turn off the lights for 10 to 12 hours each night and allow the cage to cool off through the night. Bearded dragons easily cope with nighttime temperatures in the 60s, so typical room temperatures will suit them perfectly at night. If you must use supplemental heating at night to keep the temperatures in this range, opt for overhead ceramic heating elements that do not emit light.